Imagine a world where Celtic music is on every radio station you turn dial in. You can help Celtic groups become #1 on the Music Charts. Find out how you can help here. Now that we are firmly settling into 2011, it’s time to take a quick look back at all the great Celtic music we heard in 2010–and there was a lot of it! While it’s terribly difficult to choose only ten artists to feature here, the ones that made the cut were CDs that really stood out in my memory. If you see one here that you haven’t heard yet–you might want to pick it up. These are some great albums. 2. “Robert Burns Rocks” by Hugh Morrison. Those who know Morrison’s music won’t wonder why this CD makes the list. Every CD he puts out is an enjoyable listen, and this is no exception. 3. “Celtic Fire” by Maidens IV. Sometimes a group will show up again and again in the “best of” lists. This is one of the most amazing Celtic groups out there, in my opinion. Harmonies, energy and talent combine to set the music aflame! 4. “Three Mile Stone” by Three Mile Stone. If you are a traditional Celtic music lover, this is a super CD to add to your collection. Enjoy the jigs and reels presented here along with other songs. 5. “Songs From The Harp Room” by Claire Roche. I’ll admit that I have thought the harp to be a boring instrument at times—but not when Claire Roche is behind the strings. There is a delicacy here that infuses each song with a particular style and emotion. It’s simply a lovely album. 6. “Cabbage” by Gaelic Storm. You can count on this band to put out a great CD every time and this 2010 release serves up 14 tracks of excellent tunes. 7. “Electric Green” by Cady Finlayson & Vita Tanga. Electric indeed! The fiddle here is (as always) screamingly good. Cady Finlayson does something different on this CD though—by adding a French guitarist. Guess what? It works quite well! 8. 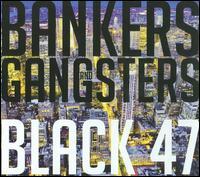 “Bankers and Gangsters” by Black 47. This interesting CD tackles complex subject matter and creates lyrics with seeming ease. The Celtic rock vibe is ever-present, along with a myriad of other musical influences. Great! 9. “Skulduggary Street” by Barleyjuice. This CD makes the list for sheer originality. Celtic rock taken on a ride and set up much like a musical, this album tells a story. Every band member wrote something on the CD, and it is a real melting pot of sound and skill. 10. “1,000 Feet Closer To Hell” by Jasper Coal. This isn’t a CD for the shy and inhibited. That said, those who love the likes of Flogging Molly or the Dropkick Murphys, this will surely please you. And the band has range too. Good stuff! Well that’s it for the past year–although I could have added many more. It will be interesting to see where 2011 brings Celtic music. In 2010 we saw some terrific innovation, as well as tried and true Celtic fare. I’m sure the New Year will have it’s share of surprises!